Futures are indicating a big gap up come Monday morning, so it looks like the market could blow through my 1695-1700 target. This market somewhat reminds me of the reverse of the 2008-2009 bear market. In 2008-2009, the market would bounce for a little while and get bulls hoping the bottom was finally in -- then it would collapse again to new lows. The market didn't form a long-term bottom until bulls had all but given up entirely. I recall in March 2009, investor sentiment was over 70% bears. We may need to see that shoe on the other foot now, and I wonder if we aren't awfully close to the point where bears capitulate. The ongoing challenge of speculating as if we were working within a "normal" market framework is that we have continued Fed money pumping -- and as the saying goes, "You can't keep a good printing press down." "Larry was a critical member of my team as we faced down the worst economic crisis since the Great Depression [APPEAR CONCERNED], and it was in no small part because of his expertise, wisdom, and leadership that we wrestled the economy back to growth [GESTURE WILDLY AND FORCEFULLY, AS IF WRESTLING] and made the kind of progress we are seeing today [PAUSE FOR LAUGHTER]." Anyway, I'm wondering if this bull market will just keep running, until we reach the point where everyone reflexively buys every dip and bears have completely capitulated. If it behaves as the inverse of 2009, then when the real top comes, everyone will naturally assume it's just another pause. 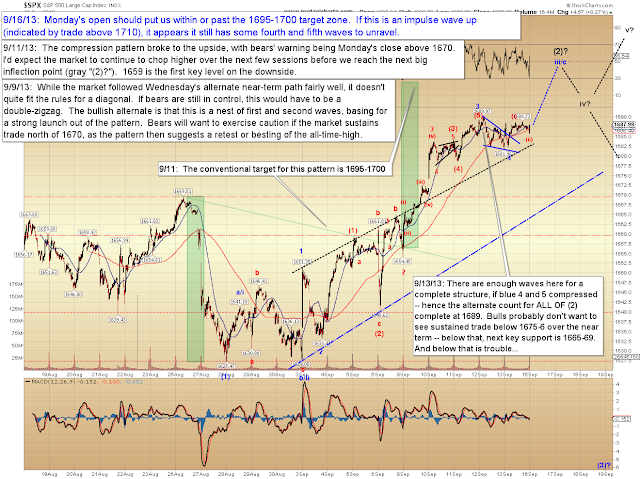 Technically, the bear count won't be invalidated until the S&P 500 (SPX) trades back above the all-time high. The market has shown the 1710 area as resistance, and it's tough to get too bullish near resistance (or too bearish near support). 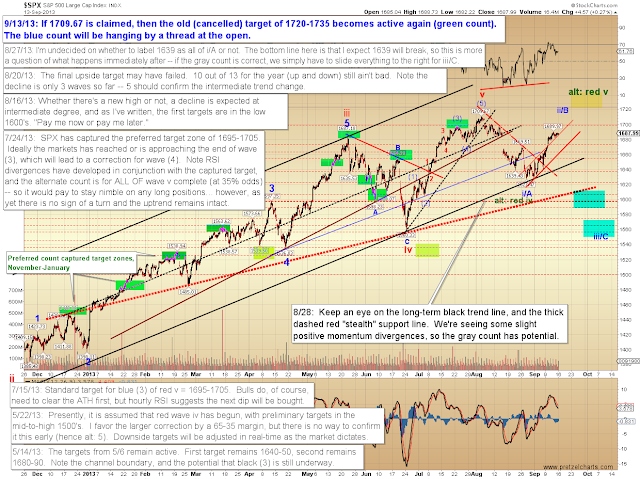 Keep in mind that the market often likes to run just a bit farther than a key level to grab stops before reversing, and my original (but since abandoned) preferred count target for SPX was the mid-1700's. 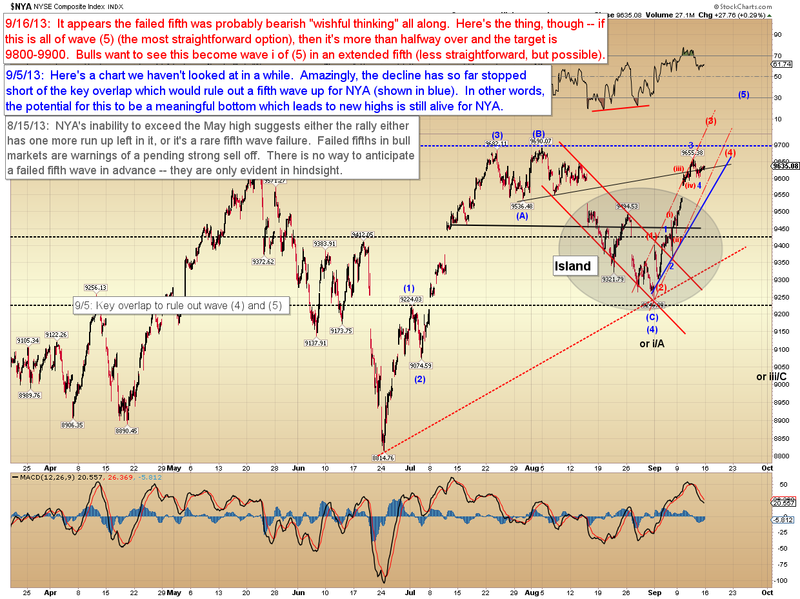 Certain indices like the NYSE Composite (NYA) have been suggesting that a fifth wave up was still needed -- I noted those signals weeks ago; in hindsight, I probably should have given them more weight than I did. 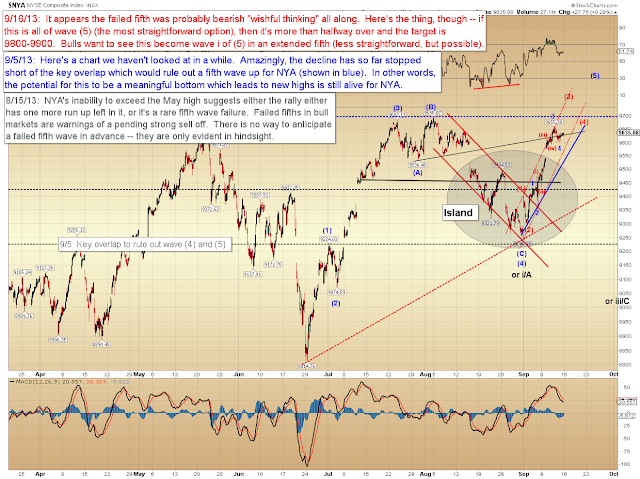 NYA "should" make a new high here; and it will be interesting to see how SPX behaves after the opening gap. 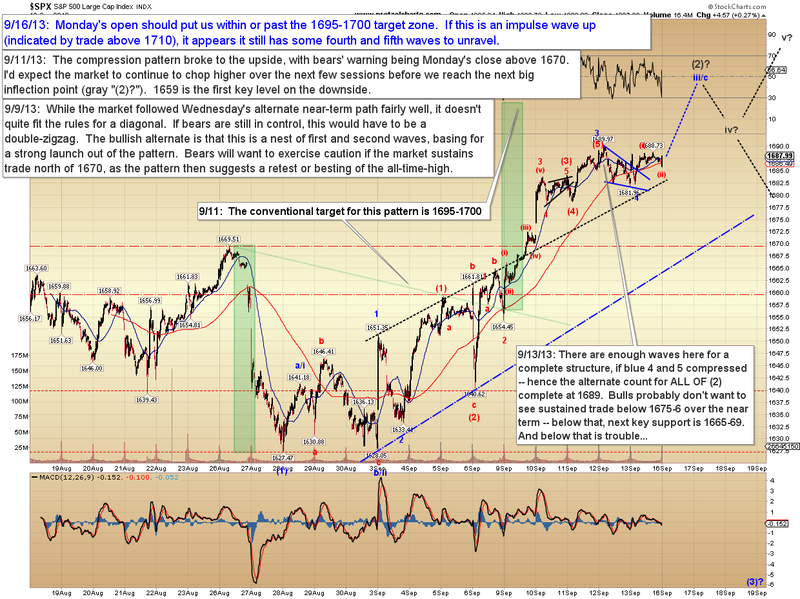 Even if 1710 is claimed, in the bigger picture, we aren't presently talking about a blow-out rally. Bulls will have to keep their fingers crossed that the pending potential impulse wave is only wave 1 of the larger red v.
In conclusion, the bearish wave count may be reset this week, but presently that doesn't put the bears out of the running. 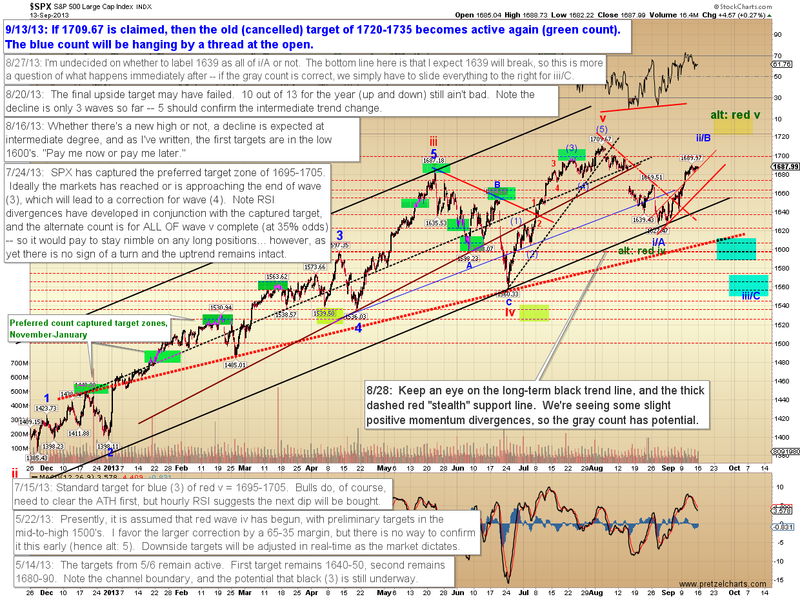 If 1710 is broken, then we'll have to see the form of the next decline to help anticipate if this wave is indeed going to mark all of red v and lead to a protracted decline, or if it's only going to mark wave 1 of red v. And if mere mention of a protracted decline makes you feel hopelessly frustrated, then we may actually be getting close. Trade safe. We must be entering a new secular bull market now. After all, the recent cover of Time magazine has a bull on the cover with a caption "How Wall Street Won". Word on the street is that Janet Yellen has never found a printing press that she couldn't operate. "EV101", if Time magazine, or other magazine, screams Bull !!! than a top is near.